Is Boston not included because there are no discounts flying from there? Or do you just do the most popular? Thanks! There haven’t been any deals to/from Boston yet. But there will be and we’ll be posting them soon. I’m hoping you can give me some advice. My family of 5 will be traveling to Honolulu late July. I’m hoping Southwest will offer some great deals but when should I buy our flights. I’m seeing the best price around $592 right now. 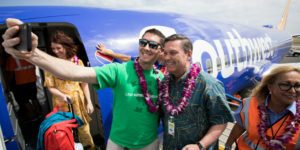 Southwest fares, when announced, will go through summer. So stand by for that. Thereafter as competition develops, more sales and lower prices will follow. Perhaps $400 as target from San Diego and Bay Area. We are flying from either San Jose or San Francisco to Kauai in mid October and then on to Maui and flying from Maui back home. We have used Alaska in the past with a direct, non stop flight. I was surprised to look and see that there aren’t any direct flight to Kauai via Alaska or American. Do you think this will change? I am looking to book flights for next Christmas 12/19/19 to 1/3/2020 for a family of 5. We have already booked our condo’s in Honolulu and Kauai, so getting anxious about our flights. I have heard this is a busy time and to book early. We are traveling from Cleveland, Ohio. Pricing right now is almost $1300 on United and even more on American. 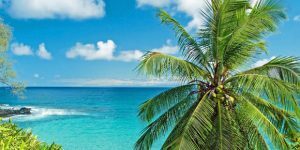 We prefer one stop each way but are willing to do a round trip from Honolulu to keep the price down, and then buy inter-island air through Hawian airlines. Do you think Southwest adding flights will help during the holidays? Prices even in November are $400 less, so wondering if waiting is our best option. As we continue to say, this year is a whole new game and is much harder to predict than is normal. Generally you want to buy 330 days in advance for end of year holiday period. That includes car rental too as those will be sold out. We’re seeing about $1200 on either airline. Not sure if it will get lower or not. It won’t help to fly to Honolulu and then do inter-island unfortunately and that brings in another set of problems. Sadly, gut call is to buy for your peak season dates now. Our daughter is moving out to Hilo to attend UofH in the fall. We’re planning on sending here out there around the 2nd or 3rd week of August. Any idea on whether the rates currently posted for travel at that time could lower? Currently, it’s at about $328 one-way from Sacramento to Hilo, on Hawaiian Airlines. Getting to the islands will be cheaper, but we aren’t sure when Hilo might be impacted by Southwest’s arrival. We’d expect a fare of low to mid $200’s on that route. Perhaps not 2nd week of August, but for sure by 3rd. Time to buy might be June. I would like to fly to Honolulu in May. Is that a good time to get good prices and what airline should I look for? Yes May is a great time for every reason. Pricing and airlines depend on where you are flying from. Due to government shutdown and time to get FAA back into full motion after that ends, no one has an answer to this. If you’re flying first week of April then unlikely you’ll see rock bottom prices. After that you should. I’m traveling from Los Angeles to Honolulu in May. RT is showing at $476 right now for Hawaiian airlines, which isn’t a good deal from my past experience. Would you suggest to wait for lower prices or do you think this is the best I’ll find? Yes suggest waiting. Once government reopens and a little time passes, we’ll have SWA, and that will help overall. Plus we should just see better prices for LA. Perhaps $150 less RT. I’ve been waiting for fares to drop so my mom can visit in April from Phoenix. Sadly, the fares have remained at $800+ on Hawaiian during all the times I’ve been searching, and the fare sales aren’t appearing, even with the direct link from Beat of Hawaii. Is there something special I need to do? Thanks! You didn’t say where she is flying to. For example to Honolulu, there is $537 RT all of April except weekends, so definitely less than the $800+ you mentioned. oops, sorry — she’s flying into Maui. I tried using the Beat of Hawaii link, but was unable to find anything for most of April under $800. $500’s on Hawaiian and on American most days between Phoenix and Maui. Even weekends. Aloha😌 I will visit West Coast between 4th and 18th Feb. Could you please help me find some nice roundtrip fare to Hawaii from Sfo Oak Lax or others for 3-5 nights? Airports for departure and arriving on West Coast could be different. Thank You! At this point, why not just watch as we announce next airfare sales and see what would work best for you. Your dates should be good for sale pricing. Hey there! Could you please lmk your thoughts? 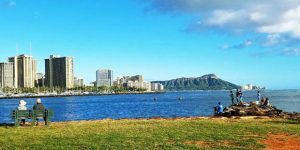 We are traveling from Boston (BOS) to Honolulu (HNL) 5/15-5/24. Round trip is about $1000. Is this a typical rate? Would you recommend waiting to book to see if it drops at all? Thank you and warm regards. Suggest waiting a bit longer, with a target price in mind of about $600. I’m hoping you can offer some guidance, please. We will be traveling from DFW to either HNL or OGG May 31-June 8, right at the beginning of the high summer season. Our dates are only flexible by a day or two on either side unfortunately. Currently Alaskan has flights from the low $700s. American though (our preferred airline), is about $1,100. Do you think if we wait, the airfare will come down a bit? There’s 4 of us traveling, so we’re hoping to pay a bit less if possible. A quick glance through seat availability shows that the planes are basically still wide open. If you want the AA nonstop, then that will probably stay pricey. Also your dates are Friday/Saturday, and those will virtually always be more. You can probably save a couple of hundred by adding a stop, and moving to mid-week, if that helps. We are planning a trip from SFO to KOA May 2 – May 9, 2019. Current RT prices with United is $398 non-stop. Should I buy now or wait? Very reasonable price. If schedule and other aspects work for you, wouldn’t hesitate at under $400. Looking to go from SAN to HNL in April. 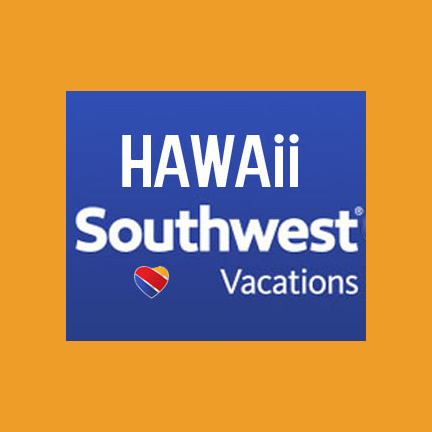 Do you recommend jumping at one of the $198 one way sale prices on Hawaiian or continuing to wait for lower prices as a result of the South West announcement? I gotta tell ya. When Southwest becomes available, I will probably look at them very seriously. My travel plans had me returning on a certain day and there was NO award travel at all. I booked another day for my hotel and then booked my flight with Hawaiian. Now they have opened the award travel for that day. Southwest never plays those games. Are these RT or 1 Way fares? Any idea if we’ll see Midwest deals (any island) for February/March 2019? I missed out on the $350 sale last month and right now tickets are about $530! I am a first timer to want to go in summer for two weeks from Houston to Hawaii? What are the first islands for a first timer. Also do I look out for summer deals and what is a good best prices would like to visit two islands! Kauai and ? Thank you. Tough call on your high season, spring break dates. Could come down, but if it does, might happen more last minute than you’d like. Gut feeling is that it won’t sell out, so in that regard you should be okay. Also the likelihood of going up is less than of going down. Sorry we can’t help more. 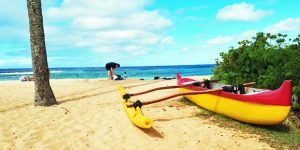 Looking to Travel from SEA to HNL (Seattle to Honolulu) January 31 – February 9th (could do February 1st – 9th if cheaper). I see the link that says “Seattle” is supposed to be around $181 however I am only seeing $507 per person when I click on the link. Am I doing this correctly? How can I get the $181 tickets? Mahalo. Currently $185 each way with one stop or $213 nonstop. It was $181 each way when published. As it says in virtually all of our fare sales, they need to be purchased the day they are published.